Roses hold a special place in my heart. The fragrant flowering shrub covered the fence line that ran along the boundary between my grandparent’s house and the First Baptist Church. Reds, whites, yellows. Nothing very exotic as rose gardens go. My grandma just liked a good sturdy rose, thorns and all. As a girl, my two favorite pastimes at grandma’s house were reading and running the rose fence. I ran along it, breathing in the perfume of her precious roses. 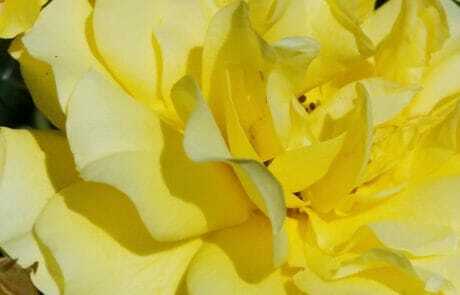 I would tell her that I could smell the different colors and that yellow was the most fragrant of all! I think about those times more often now, which is probably why, on a recent visit to San Jose, California, I was so attracted to the 5 ½ acres of rose shrubs at the municipal garden, also dubbed “America’s Best Rose Garden.” As I entered the garden through a vine-covered pergola, I stopped to take in the fragrance that greeted me. Imagine what it smells like when you are surrounded by thousands! The 3,500 rose shrubs, representing nearly 200 varieties, are planted around a two-tiered water fountain in the middle of a reflecting pool with walkways throughout the grounds. Visitors stroll, take photographs, and picnic on the lush green lawns. From coast to coast, roses are featured in gardens open to the public, often maintained by small, but dedicated armies of volunteers. 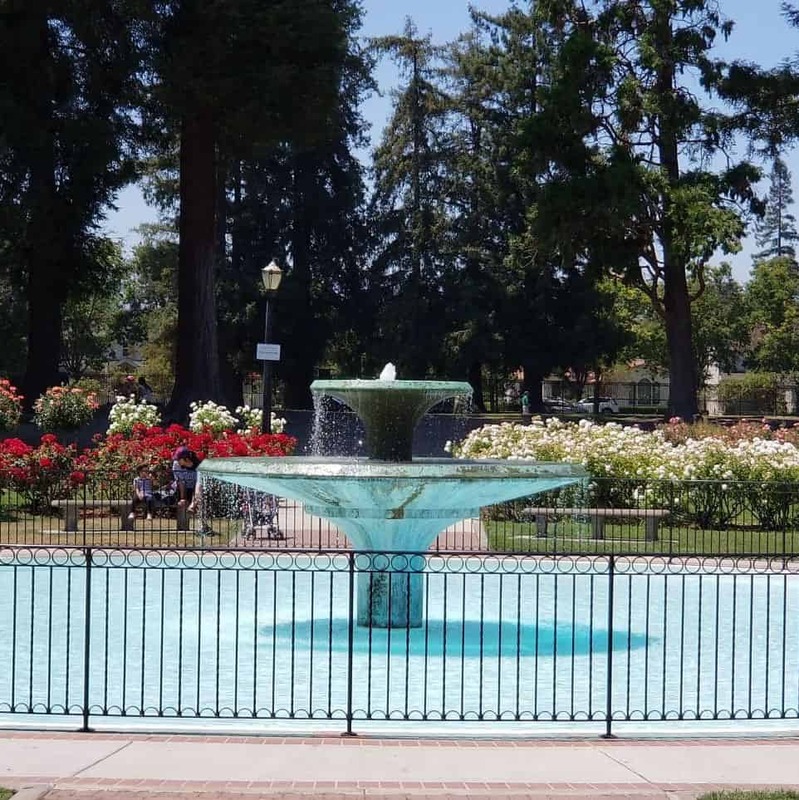 As was the case with the San Jose Rose Garden, municipal budget cuts often threaten small attractions like rose gardens. We can do our part in helping out by visiting these gardens as a small demonstration of their importance. No matter where you visit or live, there’s likely to be a rose garden close by. 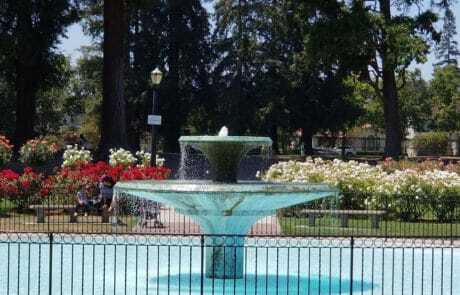 Here’s a sampling of choices across the U.S.
Just north of San Jose in the Bay Area is the Berkeley Rose Garden, opened in 1937 as a project of the American New Deal. The garden features a terraced amphitheater and 220-foot-long redwood pergola. The roses are at their peak in mid-May. 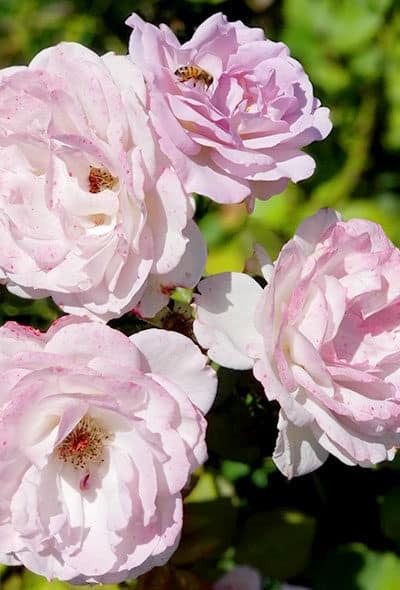 Traveling up the coast to Portland, Oregon, visitors can tour the official oldest, continuously operated public rose test garden in the U.S. The International Rose Test Garden features 650 varieties among more than 10,000 rose shrubs. Free tours are offered daily at 1 p.m. during the summer, which organizers say is the best time to visit. 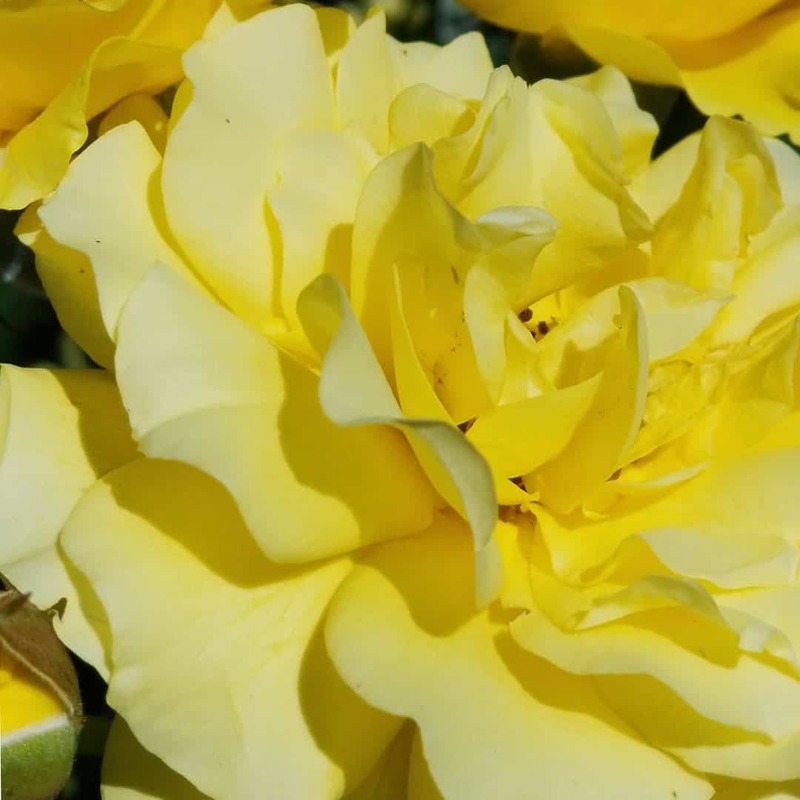 If you are in the northeast U.S., you can tour the Dr. E.M. Mills Memorial Rose Garden in Syracuse, New York, near the campus of Syracuse University. It won 2nd place in the All-American Rose Selection competition. The garden is known for its Lawrence Johnston climbers and David Austin roses, which usually bloom in June. 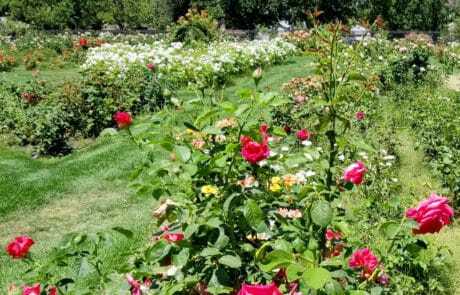 The Arboretum and Rose Garden in Renziehausen Park in McKeesport, Pennsylvania, is another winner of the All-American Rose Selection competition. Along with more than 1,800 roses, the garden features butterfly and herb gardens, a water-lily pond, and the Julia Child rose. In the southeastern U.S., located on 20 acres of Gulf Coast waterfront property, the John and Mable Ringling Museum of Art Rose Garden, in Sarasota, Florida, spotlights roses in a traditional Italian circular garden design. While you are on the property, you can visit other attractions of the Bayfront Garden, including the Dwarf Garden, the Secret Garden, and the Millennium Tree Trail. If you are more centrally located, you can stop and smell the roses and honor America’s war veterans with a visit to the Longmont Memorial Rose Garden in Longmont, Colorado. Of the almost 2,000 rose bushes representing 190 types, few are new varieties and few bushes need to be replaced because of the careful maintenance of volunteers. That means that you may be smelling roses from some very old plants. If big is your thing, then head to Texas. At 14 acres, the Tyler Rose Garden Center is the largest rose garden in the U.S. The municipal garden is open 7 days a week from sunrise to sunset. Perhaps the most well-known is the White House Rose Garden. Edith Roosevelt can be credited with establishing a colonial garden on the grounds, but it was an amateur landscape architect, Ellen Axson Wilson, wife of President Woodrow Wilson, who in 1913 converted it into a rose garden. The rose garden borders the Oval Office and West Wing of the White House. The White House hosts garden tours twice a year over a weekend in the spring and fall. Why are roses so popular? That which we call a rose comes with a variety of some 30,000 names and apparently smells sweet around the world. (I hope you got the Shakespearean reference!). In part, the popularity perpetuates from its continued reference in poems, plays, movies, books, and quotes. A more likely reason for its favored status is that it’s relatively easy to grow and can be cultivated in climates across the globe. A rose shrub will grow pretty much anywhere. Roses also have symbolism around the world. 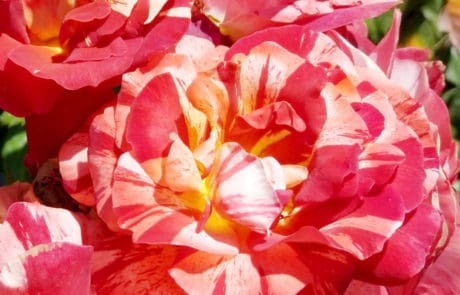 Rose colors can impart different emotions, such as love, sympathy, or honor. Throughout history, roses have often been associated with numerology. 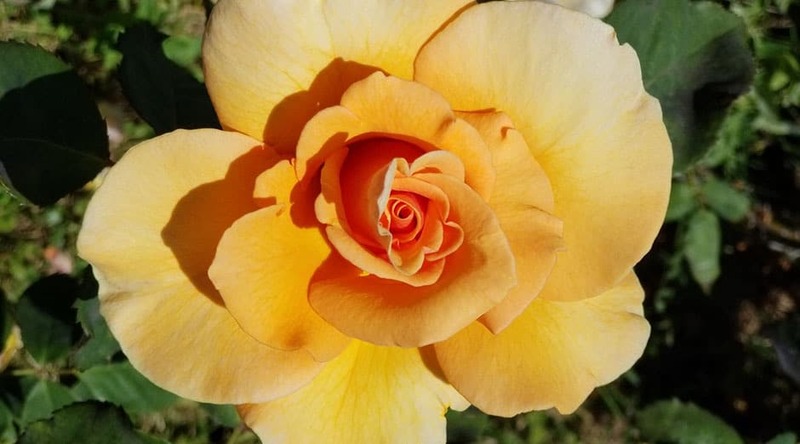 For example, a rose with eight petals was linked to rebirth and renewal, but with seven petals, the rose represented inclusiveness or a universal understanding. The rose as a symbol has long been associated with religion. In Medieval times, Christians associated the five petals of a rose with the five wounds of Christ. It was later associated with the Virgin Mary. In Islam, the rose is a symbol of the soul, flowering among thorns. In Hindu legend, the god Vishnu, the protector and preserver of life, is said to favor the rose among flowers. In Buddhism, a red rose symbolizes true love that will stand the test of time. Rose history dates back to ancient China. Recorded references to widespread rose cultivation are noted as early as the 4th and 5th centuries, according to the China Floral Encyclopedia. Historians note that roses were grown extensively throughout the Middle East during Roman times. Roman nobles established large public rose gardens in the southern parts of Rome. During the 15th century, roses were used as symbols of rival factions in England. After the Hundred Years’ War, a power struggle resulted in renewed support for Richard of York’s claim to the English throne. A series of civil wars broke out as rival branches in the House of Plantagenet vied for the throne. 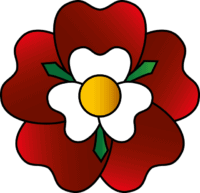 In the War of the Roses, the white rose symbolized the House of York heraldic badge and the red rose represented the Lancasters. Neither won, really. However, Henry Tudor eventually claimed the throne, putting an end to the civil wars. As the new king, Henry VII, as he was called, united the two claims when he married Elizabeth of York. The two heraldic badge symbols were united into one, resulting in the Tudor Rose. If you would like to learn more about growing roses, follow these 10 essential tips presented in Garden Design magazine. 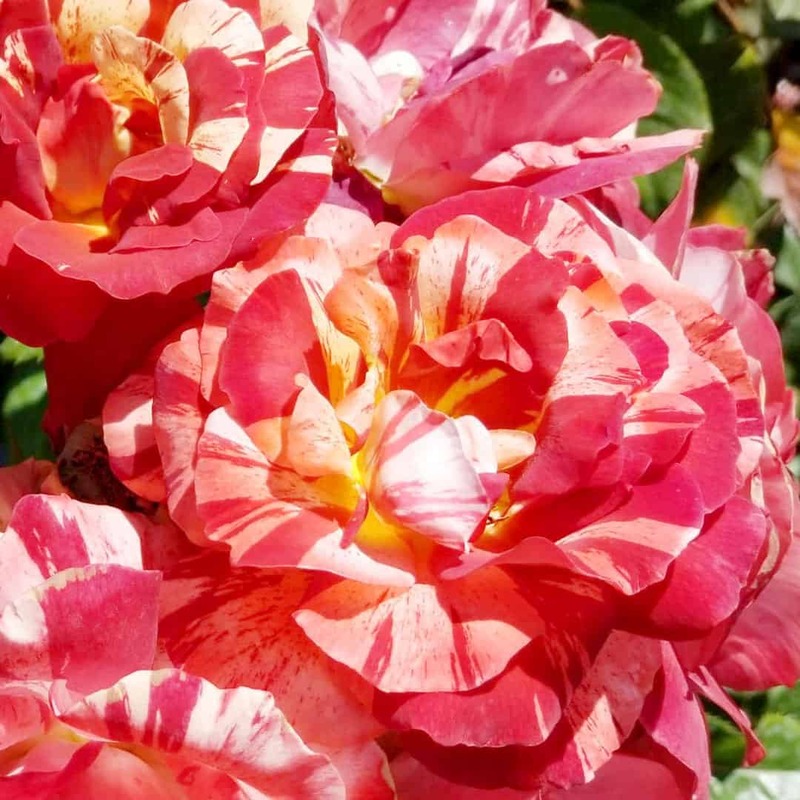 Photos taken at the San Jose Municipal Rose Garden by Teresa Lamsam. Copyright 2018. Sounds like you tie roses and your Grandma together very tightly, it’s really lovely and makes me think of mine. Would be heartfelt to go to Longmont Memorial. Such a lovely post! I got to visit the Rose Garden in Portland, Oregon two summers ago – it was like nothing else! 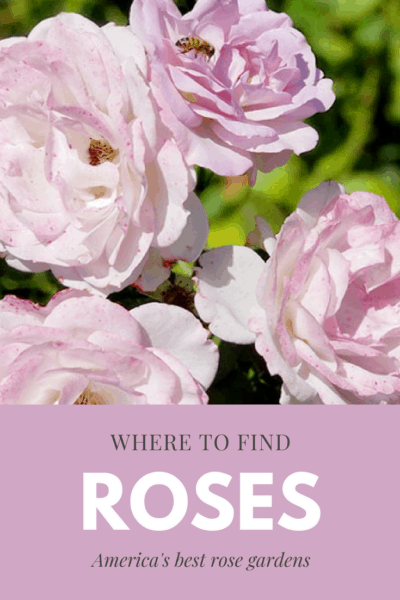 I have learnt so much about roses in this post! I think it is wonderful that your grandma’s love for sturdy roses allows you to remember her through that wonderful symbol. Strangely enough, I visited a park which was quite far away, I have since apologised to my partner for forcing us to drive that far, where I spent many happy times with my grandparents. I wanted to visit to feel closer to them and it was nice to talk about happy times there with my partner. I think nature has a way of connecting us as people, even with those loved ones who have passed on. Beautiful photos. I’ve never been a big flower guy but now I know why some of my family members love them so much! It took me almost 4 decades to rediscover my fondness for flowers, especially roses! The only one of these we have been to is the Portland Garden. It was very worth checking out. There is also a beautiful Rose Garden in Stanley Park Vancouver Canada. Technical not in the United States, but worth the trip north. Botanical Gardens (and rose gardens) in Canada are on my bucket list! Perhaps some day! 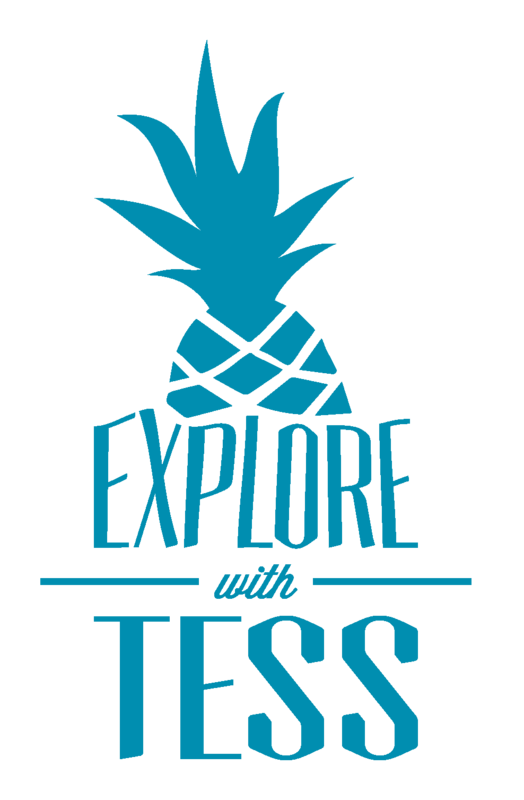 I so agree about sharing our adventures! I grew up in Columbus Ohio, home of The Park of Roses with over 12,000 roses. It was the terminus for many bike rides in my youth and will always hold a special place in my heart. I love rose gardens. Was not aware that there are so many rose gardens in US. Would have loved to see Tyler Rose Garden Center when we visited Texas. Discovered quite unique things about the rose, especially the connection with the number of petals in the rose and the associated meanings of it. Something new to learn as an Indian that the god Vishnu is said to favor the rose among flowers. Roses are such special flowers. For me, especially when they are long-stemned yellow. Now I have to pay attention to number of petals, too. Live your grandma story. I love roses too. I do love how they smell, but I love their looks probably more. All the different colors they come in and their vibrancy! I honestly had no idea there were this many actual standalone rose gardens across the US. I mean most all gardens have a “rose garden”, but I didn’t know there were so many all-rose gardens! The White House Rose Garden would be amazing to see! I’ve been to the White House a couple of times, but haven’t seen it! I also didn’t know that the rose dates back to China! This is so lovely. Rose gardens are so beautiful and there is something romantic and tender about them. It’s amazing how many different kinds there are – and on your pictures, they look so beautiful. Agree with Anthony that the rose garden in Stanley Park is spectacular. 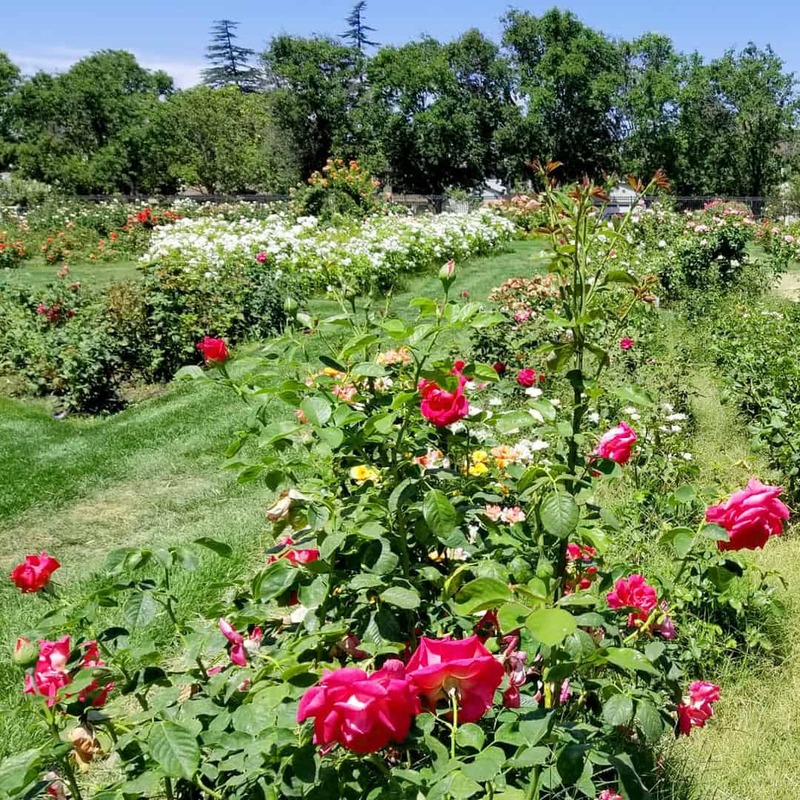 Love rose gardens where ever they are … we have a lovely one on the Capitol Mall in Sacramento called the Peace Rose Garden that is well worth a visit should you ever find yourself in northern California. While I am not much of a garden person, but I love visiting the gardens when the flowers are in full bloom. Went to one such flower gardens called Shalimar Bagh, in Srinagar India, a couple of years back, and it was amazing, as the flowers were in full bloom and the pictures came out awesome.